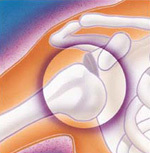 The shoulder joint is the body’s most mobile joint. It can turn in many directions. But, this advantage also makes the shoulder an easy joint to dislocate. Sometimes dislocation may tear ligaments or tendons in the shoulder or damage nerves. The shoulder joint can dislocate forward, backward, or downward. A common type of shoulder dislocation is when the shoulder slips forward (anterior instability). This means the upper arm bone moved forward and down out of its joint. It may happen when the arm is put in a throwing position.